The accelerating pace of Valossa Labs Ltd, a spin-off from our Center, has been physically tough. When the team won the Midnight Pitch Fest last summer, a coder fainted after hearing the news. The team was tested again at the end of September when it headed to Silicon Valley to participate in TechCrunch Disrupt event, where hundreds of technology start-ups presented themselves and met potential partners. “I showcased our demo so much that my voice disappeared,” tells the hoarse-voiced CEO Mika Rautiainen about the consuming but successful trip. The demo stand of Valossa received a lot of visitors, which means that connections with potential customers and financiers were established. This led to many new negotiations. One of the members, Ville Hulkko, remains in California to set up sales representation for the company in Sunnyvale. Valossa Labs Ltd (formerly Deep Content Company) was established in October this year. The team shown in the photo includes (from left): D.Sc. Otso Kassinen, Henri Huttunen, D.Sc. Mika Rautiainen (CEO), and Karita Kasurinen. The AI-powered video technology company targets specifically the US market, because that is where the most important actors for entertainment industry can be found. Encouragement and positive feedback has strengthened both self-esteem and faith in the idea of more intelligent video search. More than ten years of research at the University of Oulu, Department of Computer Science and Engineering, laid the foundation for the company’s service, which is a search engine solution designed for discovering movies and TV content. By understanding descriptive queries through text input or voice control, the engine is able to find suitable movie content, even if you cannot remember the name of a movie. “If I say, for instance, find me a movie where a boy learns he is a wizard, I will get Harry Potter 1 as the first result and a link to a streaming service or a video store, plus many other similar movies” says Rautiainen describing the technology demo of the solution, which can be tried at www.whatismymovie.com . Rautiainen, who has worked with multimedia information and retrieval systems explains that they analyze audiovisual and other unstructured data for relevant patterns from content descriptive sources, and turn it into a deep content index. The algorithm-based search is then able to find the desired results matching the query. The service is not aimed directly at consumers; the goal is to acquire corporate customers with desire to improve their end-user video experience. For example, entertainment giants like Netflix or Amazon could take advantage of Valossa’s solution, and improve the quality of their own services. “Speech interfaces, for example, in cars, Smart TVs and smartphones are already common in the United States. Devices obey the voice commands of people”, Rautiainen explains the integration process of voice search service. English is the international language of science and business. One of the reasons why speech interfaces have not become as established in Europe and Finland is language variety. This makes it more challenging to address European market as a whole. But voice technology is breaking through language barriers because machine learning techniques are evolving rapidly. The story of Valossa Labs started as a TutLi project (New Knowledge and Business from Research Ideas) in the summer of 2014. The project secured financing and enabled recruitment of reinforcements to investigate commercial opportunities. Entrepreneur Harri Pesola brought business insight and experience to the team. In the spring Ville Hulkko and Karita Kasurinen strengthened the team with business and marketing knowhow. The Valossa technical team was established from seasoned PhDs and MScs: Otso Kassinen, Henri Huttunen, Arto Heikkinen and Sami Huttunen. Kasurinen who has studied international business emphasizes that research-based companies need help to enter the market, as clear implementation and customer visibility are vital. However, the researcher himself doesn’t have to turn into a full-blooded businessman, but something new one should still embrace. “It is clear how Mika’s communication style has gradually changed. 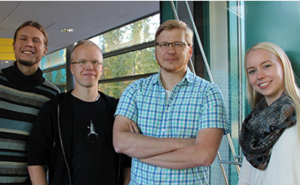 Researcher’s brains absorb information about the startup life like a sponge”, Kasurinen says. “Yes, it is possible as long as you keep humble and open mind towards new modes of operation, stay curious, ask and learn”, confirms Rautiainen laughingly. Rautiainen also encourages others to utilize research results and have an open mind for multidisciplinary cooperation because the University is certainly a great seedbed for new firms. He regrets that all too often a researcher stays only at the knowledge level, even though the study would show benefits to the society and bring new employment opportunities when applied in practice. Changing the mindset and encouraging exposure and collaboration could help create the desired positive push for Northern Finland. Taking this road can also take you to the other side of the globe, this happened to Rautiainen. Original text written by: Sanna Häyrynen.